The book deals with ideas that have the potential to change the world, and a bumpy road to turn them into business practice. Disruptive innovation and creative destruction are becoming a turning point of the New Economy. They issue an ultimatum: innovate or perish. Banking has a long tradition. Throughout centuries, it has earned its reputation as a trade based on trust, mores and conservative principles; one that is built gradually, with rigour and prudence. It has so far never been associated with technological innovativeness, but rather with the sturdiness of banks’ stately headquarters or modern high-rise office blocks which dominate the cityscape. The low-cost business model has proved its worth in a variety of fields. It has been particularly successful in passenger air transport as well as retail sales of products and services, where the new approach has changed consumer habits and the way the market functions. Low-cost finance is a disruptive innovation in the business model which is comprised of four basic elements: target client group, products and services tailored to their needs and lifestyle, distribution channels and technology. The development of the Internet and new technology allow the low-cost business model to break the existing paradigm, and ensure high quality at low prices. Its expansion is hindered by high barriers to entry in the financial services sector (capital, regulations, know-how). Nonetheless, wherever banks operating according to the low-cost business model manage to break through, they invariably change the rules of the market in a short space of time. The best examples are mBank in Poland and ING DiBa which have made it to the top three of the largest retail banks in their countries, attracting 3 million and 7.6 million extremely satisfied and loyal customers, respectively. 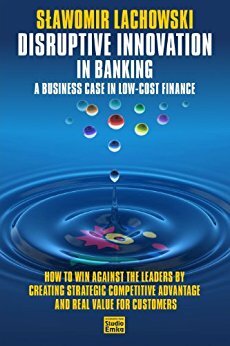 This book tells you how to win against the best by using disruptive innovation, that is the low-cost finance model based on the Internet and understanding of how the New Economy functions. "This book will restore your faith that innovation and success in business rest on people, their ideas and competence rather than their workplace or the country they live in. mBank’s operating model showcases a disruptive innovation which made it one of the largest Internet banks in the world. This pioneering project, the brainchild of Sławomir Lachowski, has achieved such staggering success thanks to adherence to the principle that a financial institution should participate in the client’s entire life cycle, and change together with them." "mBank has brought about a banking revolution. And I don’t mean remote access to the bank via phone or online banking. It’s replaced monologue with dialogue. Clients understood they were no longer “talking to the wall”. Such radical change couldn’t have been possible without a dedicated team of young professionals from Łódź and their leader – a visionary whose sight reaches a great deal further into the future than the nearest payday." "A deeply fascinating and emotive book. A valuable read for all those who have achieved professional success, but still aspire to change the world through disruptive innovations. In whatever their trade might be." "Sławomir Lachowski has written a mesmerizing book about making business dreams come true. He magnificently captures the spirit of the first decade of 21st century in his description of the grandest innovation of Polish banking, mBank, and its route to European expansion. He also shows how much room there was for improvisation and that the greatest ideas were born unexpectedly but not quite accidentally... Our paths crossed in the very first days of 2000 and, in our own way, we were both granted an opportunity to fulfil our ambitions." "You may now be holding one of the most significant books in Polish business. It is about searching for ideas – not strictly business ones but also those that change the reality around us. The Author gained his experience and knowledge along a career path that ran through Poland’s most renowned banking institutions. This guarantees the Reader is presented here with the very best source that clears up any doubts they might have while considering the business strategy of their own company, be it a large corporation or a microenterprise."